On Wednesday(November 22nd) Sonam Kapoor attended a Conde Nast Traveler India event and the Bollywood star showed off her chic look via her instagram. 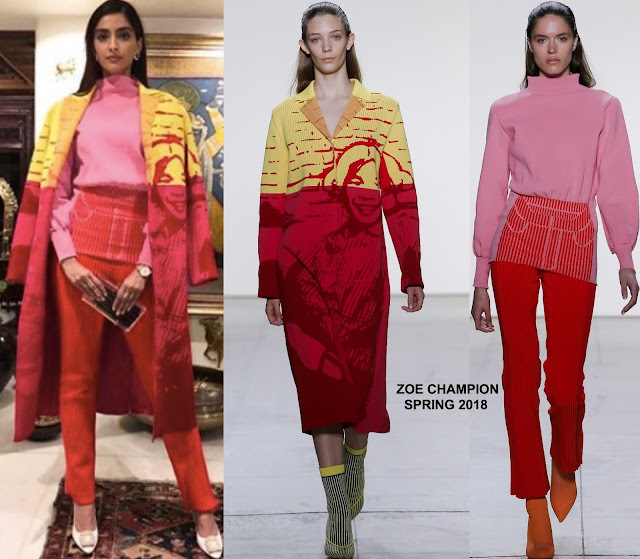 She posed for the gram rocking a ZOE CHAMPION SPRING 2018 ensemble which featured a yellow & red printed coat and a pink long sleeve, high neck tunic top & red ribbed pants. I know a lot of people that don't favor white shoes but her white MANOLO BLAHNIK really complimented her look. Straight tresses, a L'AFSHAR clutch and statement jewelry finished up her chic look.